I'm working on a settings section where the user needs to pick a radio button (or a segmented control) and each option generates a set of multiple options that can be selected in any combination. Lets call the first "location" and the latter "panels"(that are available for each location). My question is, if there is a more user friendly way of representing the multi selection dropdown (see images) and having the 2 controls grouped in a way their relation is metaphorically more obvious. Your solution looks neat and robust, I must say. I have some questions, though. are there any panels in the combo-box that are common to more locations? do the panels' names indicate location (i.e. are the panels the state/province names)? Say, I blindly opened the combo-box, selected some panels and later realised that the selected location is wrong? 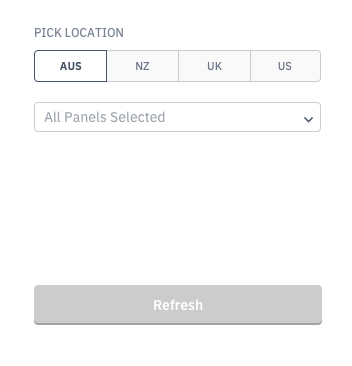 what happens when the user has selected some panels and later realised that their location is different (or were curious to see the panels for another location) but then came back to the original location? Which panels are selected then? Yes, there are panels common across locations. No, they do not indicate locations. They are actually user databases. Currently, in my design a selection of another location means a deselection of panels. In this case I'd keep the current visual layout and only disable the items in the combo-box that do not apply to the selected location. This gives the most straightforward information to the user that certain item is not available in their location. As you can see, only the combo-box corresponding to the selected location is enabled, still any selections inside the disabled combo-boxes retain their values. 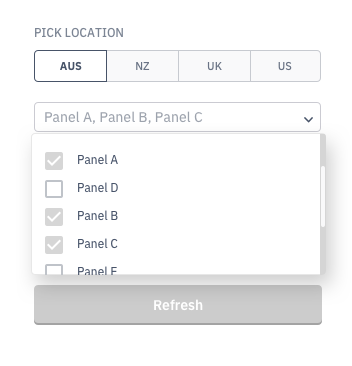 users from certain locations would have to scroll further to get to their panels than the others, provided the panels are sorted by their location. Anyway, presenting such sparse selection (roughly 75% of the choices would be disabled) is not user-encouraging, in my opinion. I have presented this solution as in my opinion presenting a sparse selection, i.e. a combo-box with roughly 75% items disabled is not encouraging for the user. Not the answer you're looking for? Browse other questions tagged usability gui-design interaction-design radio-buttons segmented or ask your own question. What is the most user-friendly way of displaying data? Radio button group confusing to user? User-friendly name for Boolean options?